The Highlands and Islands Branch covers the Local Authority Region of Highland and The Island Authorities of Orkney, Shetland and the Western Isles. This area was until 1.4.2013 policed by the Northern Constabulary and the bulk of the Branch members are from this Force or the separate Forces within the area prior to amalgamations and Regionalisation in 1975. 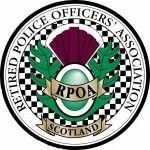 Membership of the Branch is, however, open to any police pensioner from any force in the country who is now resident in the Highlands and Islands. It is worth noting that the Northern Constabulary area – now the Highlands and Islands Division of Police Scotland – covers an area bigger than Belgium and an idea of the sheer size of the area can be judged by the fact that The Divisional ( former Northern Constabulary ) Police HQ in Inverness is nearer to Leeds than its Police Station in Lerwick, Shetland Isles! This is a work in progress – please contact Dave Conner, Branch Secretary if you have any items you would like to see added.